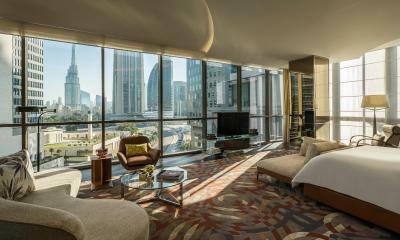 Lock in a great price for Four Seasons Hotel Dubai International Financial Centre – rated 9.1 by recent guests! Very friendly and courteous staff, super clean rooms, and excellent location. The staff is amazing and the resturants and the lobby cafe is perfect in every sense , the room is designed perfictly for comfort. The hospitality, Staff super friendly and welcoming you everywhere, the elegant of design, furniture, services super quick and location. As it is a famous hotel i ask them to give me time tell 4 pm becuse my flight is 6:30 pm From Dubai to my country, they refuse and my friend they give him tell 4:30 in the same hotel and same day of leaving !! And me they give me tell 3:30 pm !!! Excellent facilities, spacious bedrooms, lots of amenities in the bedrooms. Room service is superb. Room design and decor amazing. Staff are very accomodating. 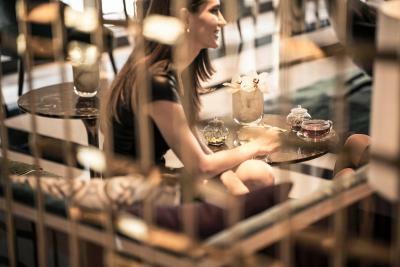 All staff members possess adequate knowledge, skill set, and expertise which are in line with the four seasons standards. And the hotel remains a benchmark for other well known hotel names to strive to reach. 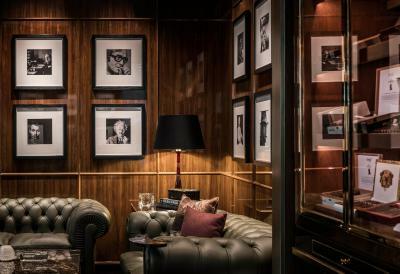 Only a handful Of hotel chains actually pay this level of attentiveness to detail, and go beyond to please guests, and ensure a spectacular stay. Everything was great. The people as always at the four seasons! 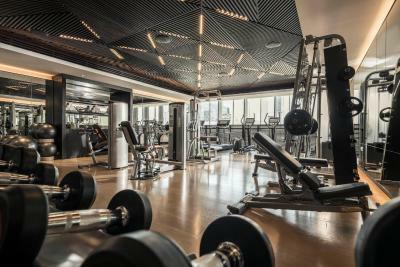 Four Seasons Hotel Dubai International Financial Centre This rating is a reflection of how the property compares to the industry standard when it comes to price, facilities and services available. It's based on a self-evaluation by the property. Use this rating to help choose your stay! 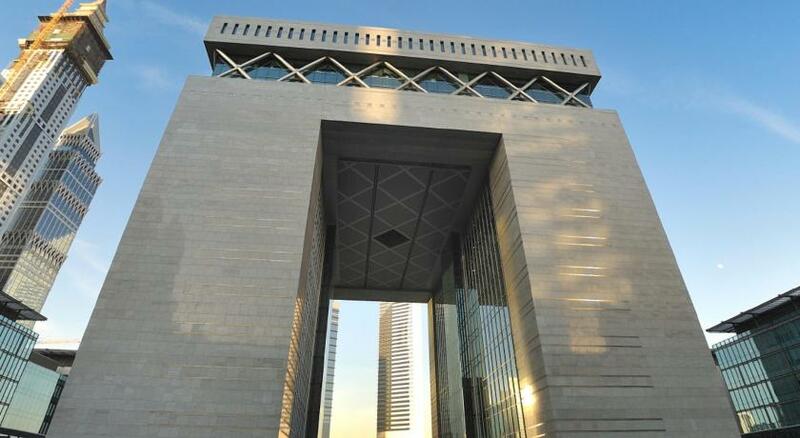 Conveniently located in the heart of Dubai’s business and financial hub, DIFC, lies the Four Seasons Hotel Dubai International Financial Center. It offers a spectacular glass walled outdoor swimming pool and a sun terrace. Guests can enjoy free WiFi throughout the property. 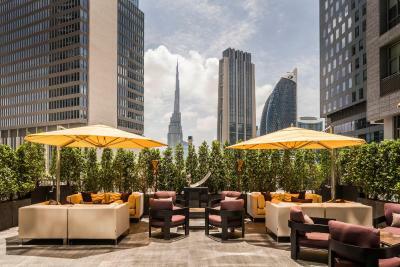 Four Seasons Hotel DIFC features four Dubai restaurants, bars and lounges including Mina Brasserie, Luna Sky Bar, Penrose Lounge and Cigar lounge Churchill Club, all ideal for discussing business, entertaining colleagues or relaxing with friends. Service at the poolside terrace and in room service is available. The hotel has a spa center ‘The Spa’ with 5 spacious treatment rooms and whirlpool hot tub, and a fully equipped fitness center. The hotel also offers car hire. Dubai Mall is 1.2 mi from Four Seasons Hotel Dubai International Financial Center, while Burj Khalifa is 1.3 mi from the property. Dubai International Airport is 5.6 mi away. Free parking and valet parking is available on site. 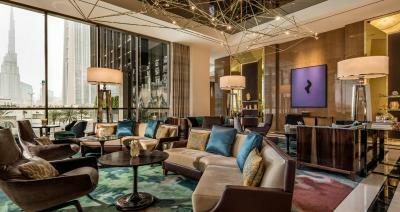 When would you like to stay at Four Seasons Hotel Dubai International Financial Centre? Each Superior Room is outfitted with wood-clad walls with metal pendants, creating a warm and welcoming atmosphere. A spacious living area features a curved sofa, coffee table, desk and 45-inch LCD TV. 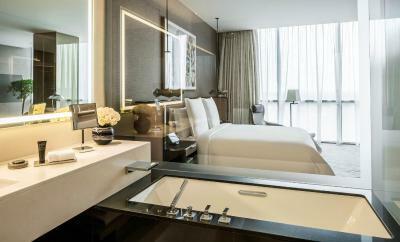 Business travelers are sure to enjoy the room’s modern amenities, such as an iPad Mini and motorized drapes, which creates total darkness for a good night’s sleep in your custom Four Seasons Bed. The spacious Deluxe Rooms combine modern amenities with relaxed elegance. 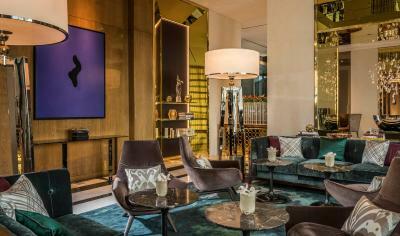 Unwind from the day in your sitting area, complete with a sofa and 45-inch LCD TV. Refresh in your spa-like limestone bathroom, outfitted with a glass-walled walk-in shower. Or retreat to your bedroom, which includes a walk-in closet and a custom Four Seasons Bed with your choice of mattress topper. Ensure a peaceful night’s sleep for the next business day ahead thanks to the motorized window drapery that blocks out any light. 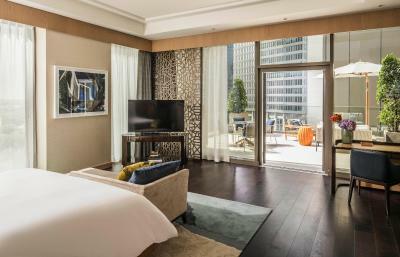 With views of Zabeel Palace gardens or downtown Dubai, Premier Rooms offer a warm and comforting retreat. Surrounded by wood-clad walls and metal pendants, this perfect wind-down space features a plush sofa, coffee table, overhead lamp and 45-inch LCD TV. Enjoy additional modern amenities such as your complimentary iPad Mini, motorized window drapery and a customizable Four Seasons Bed with your choice of plush, signature or firm mattress topper. With a practical walk-in closet and a spa-like marble bathroom to boot, rest comes easy in a Premier Room. 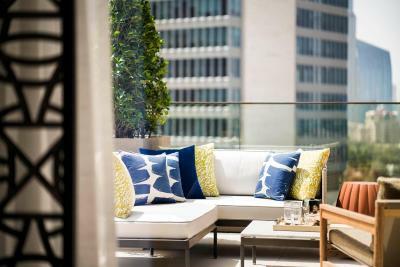 The well-appointed Four Seasons Rooms offer peaceful accommodations with refreshing views. Enjoy pure relaxation with a luxurious marble bathroom, walk-in closet, cozy living area and customized Four Seasons Bed with your choice of mattress topper. 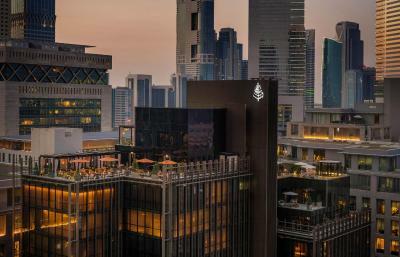 Through the floor-to-ceiling windows, relish the dynamic view of the world’s tallest building, the iconic Burj Khalifa. Modern amenities such as a personal iPad mini and motorized window drapery will further enhance your relaxing stay in Dubai. 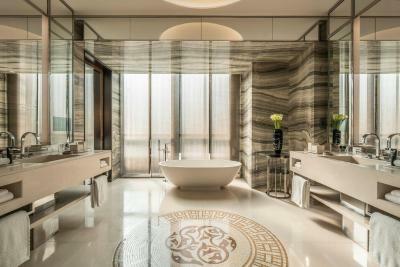 The glass wall that separates the modern limestone bathroom from the elegant bedroom in the Studio Suite evokes a luminous ambiance, perfect for relaxing before or after a busy day of business in Dubai. 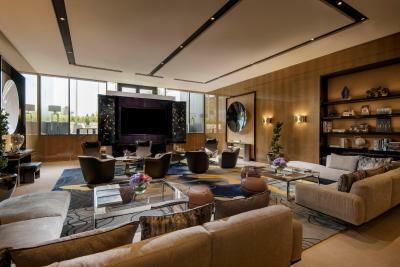 The open-concept room is designed with wooden walls, hand-tufted carpeting and a custom metal mashrabiya that frames the windows and reveals the incredible view of Dubai International Financial Center below. 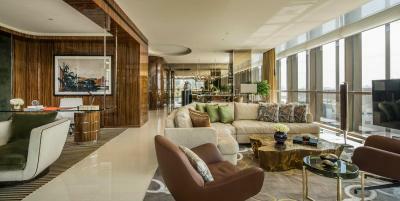 Four Seasons Executive Suites offer ample space for relaxing and entertaining during your stay in Dubai. Separate from the bedroom, the dedicated living room features a curved sofa, overhead lamp, coffee table, desk and 45-inch LCD TV. 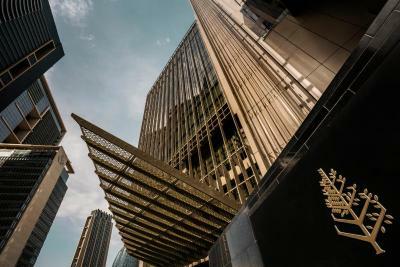 A custom metal mashrabiya frames the suite’s windows and exposes the stunning view of DIFC below. Rejuvenate in the modern limestone bathroom, complete with a free-standing bathtub, dual sinks and a separate shower. 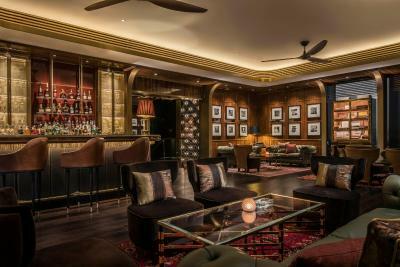 This exquisite suite combines exquisite design and eclectic interiors to embrace the tastes of a sophisticated guest. 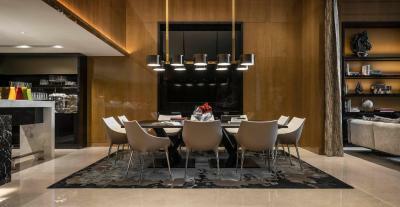 Bold shapes and eye catching furniture make up the living room along with an elegant dining room to seat parties up to eight. 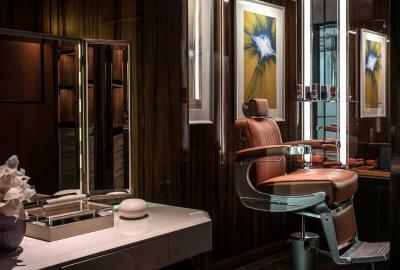 Take care of business in your own dedicated office area or retreat to the makeup or barber chair for the very best in pampering. The irresistible bathroom is tastefully embellished with Italian marble while the bedroom is the ultimate hideaway, with your own customized Four Seasons bed. 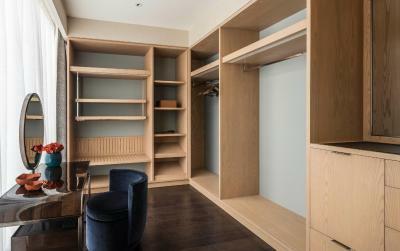 Fully tailored to guests by nature, the option to extend the suite to connect to two or three additional bedrooms is also possible at The Penthouse. The Residential Suite offers a home away from home. With hardwood floors throughout this suite offers plenty of space with a dining area for four and a refrigerated private bar. 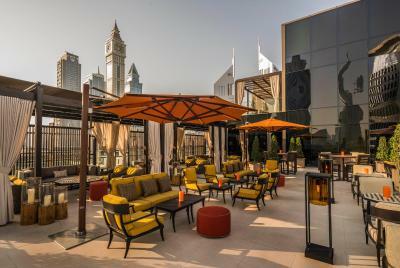 Take in views of Zabeel Palace or DIFC from your vantage point on your private terrace. This suite offers a separate sleeping and living areas. The bathroom is made of limestone and offers Roja Dove amenities. 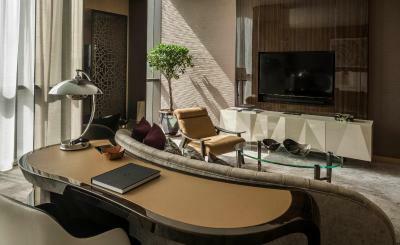 Feating a view over the Burj Khalifa, the Studio Suite evokes a luminous ambiance, perfect for relaxing before or after a busy day of business in Dubai. 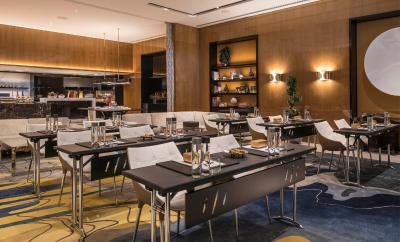 The open-concept room is designed with wooden walls, hand-tufted carpeting and a custom metal mashrabiya that frames the windows and reveals the incredible view of Dubai International Financial Center below. This suite has a tumble dryer, air conditioning and mini-bar. This twin room features air conditioning, soundproofing and tumble dryer. 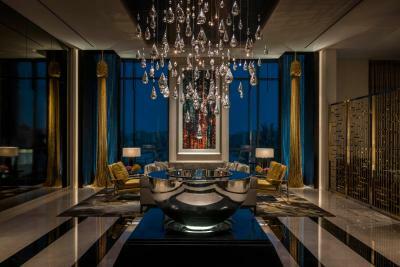 House Rules Four Seasons Hotel Dubai International Financial Centre takes special requests – add in the next step! 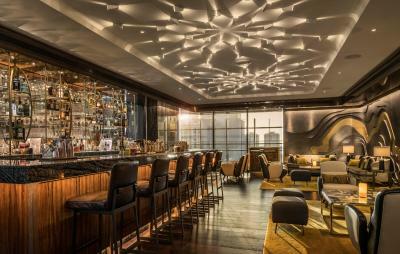 Four Seasons Hotel Dubai International Financial Centre accepts these cards and reserves the right to temporarily hold an amount prior to arrival. The Spa needs a little more attention. 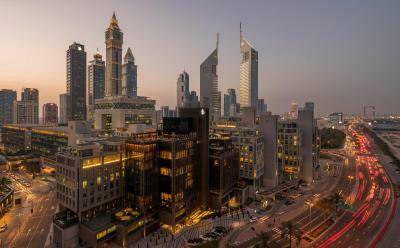 I was in Dubai for work, with meetings around the DIFC which made the Four Seasons a perfect choice. I love the fact that it's conveniently located next to a lot of great restaurants. 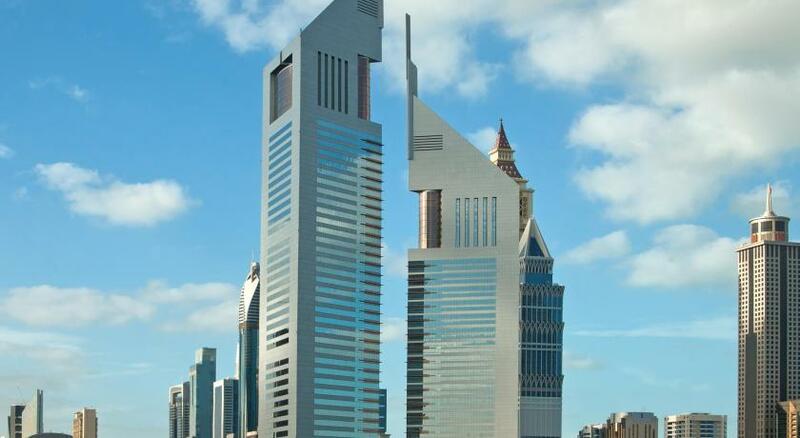 The Dubai Mall is only around 10 minutes away by car and the airport is also nearby. 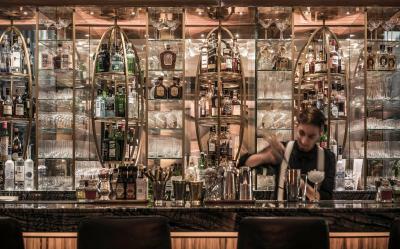 I recommend the Four Seasons to anyone who has meetings within the area but also wants to experience a little bit of dinning and leisure. The windows can’t be open for fresh air ! The windows dose not OPEN ! Front desk agent forget to note under my reservation for late check out ! !